The Promotion Fund for Vietnamese Football Talent (PVF), a member of Vingroup, will inaugurate a youth football training centre in Văn Giang District in the northern province of Hưng Yên. The inauguration on November 20 will be a landmark event to take PVF to a new level, with breakthrough changes in the quality of training, towards the goal of being the topmost centre in Southeast Asia and of achieving an international level of football in Việt Nam in the future. At the same time, PVF will transfer its entire operation to the new centre, after a period of operation in Hồ Chí Minh City. Towards the mission of training and providing talented players for Vietnamese football and contributing to developing and raising Vietnamese football to world-class levels, Vingroup has decided to improve the entire operation of PVF by investing in key and comprehensive facilities, training conditions, coaches, training documents and physical and cultural training. PVF's goal is to provide Vietnamese football with young, enthusiastic, ethical, intellectual and cultural players with world-class fitness and expertise. The new centre will be located in an area of nearly 22ha. 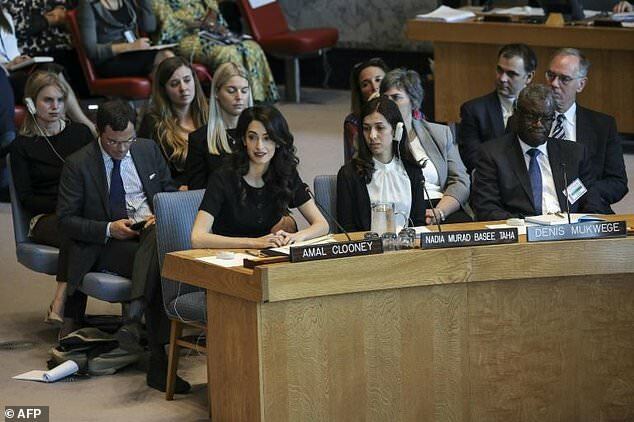 It will be of international standards and will include a training ground and modern stadium, complex of sports, science and specialised healthcare and a modern and comfortable dormitory. There will be seven playgrounds, with a focus on the main stadium, which has a capacity of 3,600 seats and will ensure the best conditions for major football matches. The remainder of six playgrounds will be built with grass surfaces that are of FIFA Quality Pro certification, including the first indoor lawn in Việt Nam. The centre will also be equipped with a 360s-simulator room and PlayerTek equipment to monitor the performance of the players. 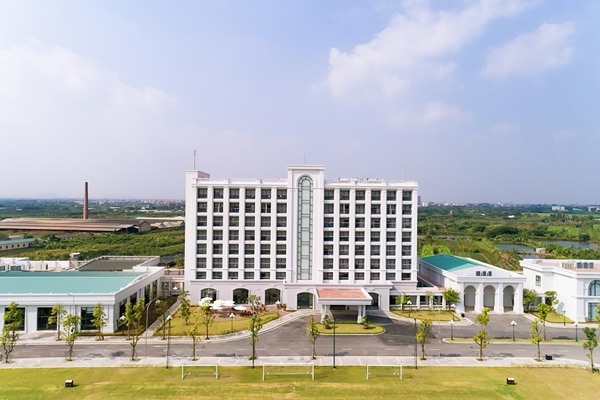 As for physical strength, in order to keep in check the physical weakness and fitness of the players, as well as in rehabilitating injured players, Vingroup has also invested in PVF Hưng Yên, a centre for sport science which is seen as the leading, modern one in the world. 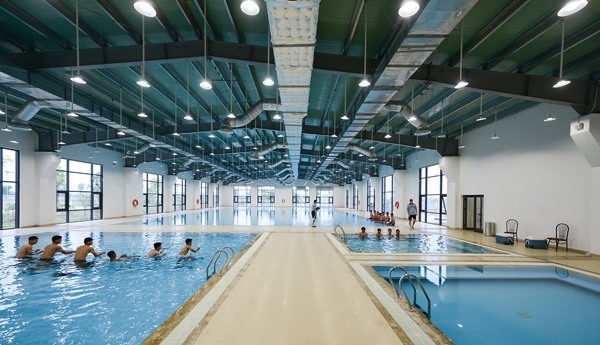 In terms of living conditions, PVF Hưng Yên is also the first football training centre in Việt Nam to have eight stories of a comfortable dormitory system, complete with a dining hall, meeting hall, library, cinema and entertainment spaces. The players will study at Vinschool, where there will be a special programme designed to ensure knowledge, culture and life skills for them. 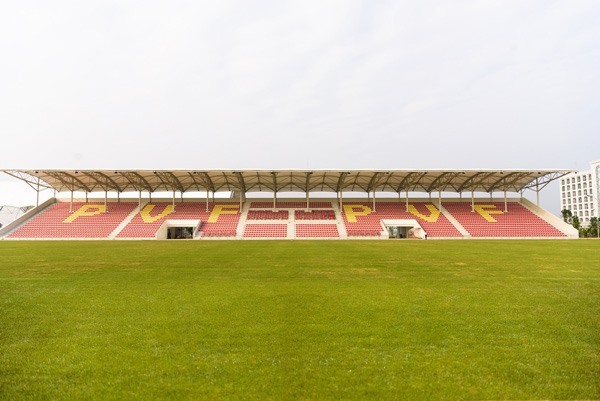 Former director of international relations for Manchester United and a consultant for PVF, Mike Farnan, said the size and investment of Vingroup towards this project can be compared to that of England's leading youth academies. Along with the relocation of the headquarters in Hưng Yên Province and investment in facilities, PVF will also ensure a remarkable change in professional quality, in terms of coaches and training materials. The coach of Việt Nam’s youngest football team, Hoàng Anh Tuấn, is currently taking on the role of the head coach of PVF. He is supported by a strong team of coaches and young players from England such as Terry Robinson, Andy Preece, Steve Stennett and Jason Brown, as well as Nick Dawes, Tom Ryan and Chris Cook. In terms of syllabus, young players will be trained under the Blueprint training programme designed by renowned football expert, Kevin Blackwell, according to the characteristics and needs of PVF. Blueprint is considered to be one of the best practices in the world, and will be constantly updated to keep abreast of world football. Speaking about the scale and stature of PVF, Vice Chairman of Vingroup, Chairman of the Management Board of the Fund for Investment and Development of Vietnam Football Talent Fund, Lê Khắc Hiệp, said with the comprehensive investment strategy for PVF, Vingroup reaffirmed its intention that it would not just build football teams playing for professional prizes but continue to pursue the development of young football. This would further contribute to building generations of talented players and those enthusiastic towards football in Việt Nam, and work towards the goal of raising the level of home football to world-class levels in the near future. 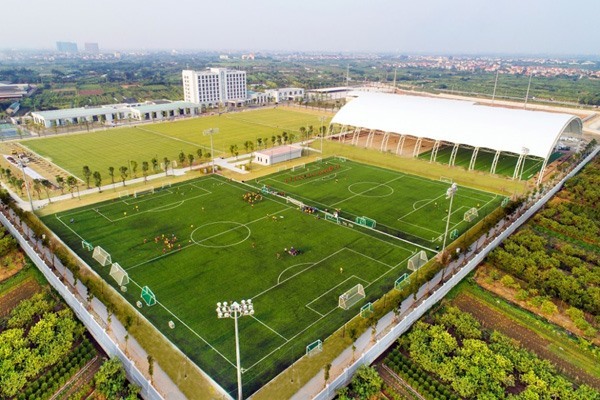 PVF has a system of four natural grass playgrounds and three artificial grass training pitches of FIFA quality, including an indoor full-sized pitch, the first one of its kind in Việt Nam. The grass on the course is flat, not dry, not watery, has a smooth surface, is even and not concave. It is built by the Velocity company from Malaysia, which has built sports equipment that has reached FIFA and Olympics standards in many countries. The playgrounds are taken care of by expert Stuart McCheyne, former head of grass care in Scotland, England, Sweden, Norway and China (Shanghai SIPG). The 360s room is an opportunity for players to practice skills on observation, concentration, judgement, ball technique, ball passing technique and finishing. The room has four automatic football passing machines in four corners, the player standing in the central area to catch the ball to pass or to finish, as indicated by the exercise. PVF is the first club in Việt Nam to be equipped with PlayerTek, capable of quantifying the travel distance, the high speed and very high speed running times and the frequency of operation and operating space. It will help capture the players’ physical conditions and practicing attitudes. The device consists of three parts: the PlayerTek Pod, a palm-sized device, Playertek Vest, a slim fit with a Pod slit on the back and PlayerTek App, a multitasking application for managing, synthesising and analysing statistical data. The most important and distinctive feature of PVF, as compared to other football academies, is that it has a sports science complex, including a 1,600sq.m giant gym centre with 66 specialised equipment, two therapy tanks and one underwater physiotherapy tank, of European professional football standards. This is where all the weakness in strength, bodybuilding and rehabilitation of injured players will be worked on each day, to bring out the best, physically qualified players. Head coach: Coach Hoàng Anh Tuấn is the first coach in Việt Nam football history to have brought the national team U20 Vietnam to the FIFA U20 World Cup 2017 in South Korea. Senior football expert from the UK: Terry Robinson, one of the most experienced brains of English football for young players, Andy Preece, who has experience in leading football teams to the Europa League, Steve Stennett, the coach of football coaches of the English Football Association and Jason Brown, head coach of the goalkeeper of Arsenal club. Clinical therapists: Nick Dawes, former head of medical service of Cardiff City, Tom Ryan and Chris Cook, sports science coaches with experience in working at Leicester City, Derbyshire Sports Academy. Professional Management: Football Focus Asia is a professional sports marketing and management company with advice from Mike Farnan, former Director of International Relations for Manchester United. The Young Football Curriculum: Kevin Blackwell's curriculum did not only succeed in bringing Sheffield United's Youth Team to the 2010-2011 Youth Finals but also in helping to train players such as Kyle Naughton, Kyle Walker, Aaron Lennon and James Milner of Leeds.